It was one of those nights. No one wanted to cook, but no one could could agree on where to go. "Cypress? Nah. Too far. Shibucho?" "Too expensive for a middle of the week. And I'm not hungry enough for omakase." After a half-hour more of this fruitless exchange, we finally made a decision. And that was to leave the decision up to fate, or at least the computer generated randomness of Urbanspoon's iPhone app. Whatever the electronic slots of the program decided was what we were going to eat for supper. The only parameters we entered was that it must be in our immediate vicinity (Tustin) and cheap (one dollar sign). What the wheels landed on was Wahoo's Fish Taco, the Orange County-born chain that three Asian surfer dudes began more than a decade ago, now everywhere. There was just one problem. I've never cared for their fish tacos. I'm of the deep fried camp. Battered, crunchy, greasy and decadent -- that's what the fish in a fish taco should be. Never grilled or made to be "healthy". But that's not what I want to talk about here. This post is about the rediscovery on what I consider the best condiment I've ever had in a quasi-Mexican restaurant. Heck, I'll even go as far as to say that it's the best condiment ever served in the whole of O.C's restaurantdom. Called simply "Mr. Lee's", it's a chili paste of unparalleled complexity, flavor and depth. Do not mistake it for salsa. No. 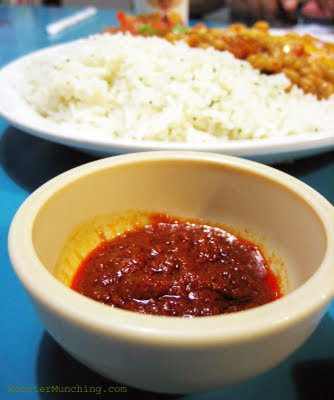 This, my friends, is Indonesian sambal. Or at least it is something that tastes just like it. Thick, dark, a little oily, it is the doppelganger to the many kinds of sambals that Indonesian home cooks carefully mash up in a stone mortar and pestle. It's hot, of course, with the equivalent slow but intense burn of napalm on your tongue. But it's also gently sweet. Behind it, there's a hint of fishiness, a discernible but understated presence of umami, the fifth flavor. If you've mastered Sriracha, Mr. Lee is the next level -- the advanced course in the hot sauce arts. And best of all, it's free. Just ask for "Mr. Lee's" and they'll hand you a thimble of it, which is enough for some, but not for me. I used up two and would've gone for a third if I hadn't already finished my enchilada plate. I slathered it on everything. On their enchiladas, which are better than I remembered them to be. On the beans. On the rice. Everything. The sambal elevated it all, but especially the carne asada steak in the enchilada, which was cut into stamp-sized squares, already unexpectedly tender. The carnitas that filled the other enchilada -- blubbery and moist -- were perfect in their design to grab on the Mr. Lee's like a mop. Now, just imagine what a few dabs of this stuff would taste like on a deep fried fish taco! Elmo, don't get me wrong, I love you with all my food-blog-readin' heart, but man, Wahoo's is to Mexcian food as Panda Express is to Chinese food. Hahaha. Totally with you man. I was going to put in a part in there that points out that it is, at best, dubiously Mexican, as any place that serves onion rings along with tacos, are. It is in another genre unto itself -- surfer food, if you will. But that chili paste! Interesting condiment! However I have never tried both Indonesian or Wahoos before. I am so behind! And talking about the Urbanspoon iPhone App- this weekend I was in Costa Mesa looking at your blog on the iPhone for some ideas of places to eat! We ended up eating at the Clubhouse as it was the closest restaurant to us during our walking trip at South Coast Plaza but ended up later on finding the Macy's Signature Kitchen and Hamamori which I previous read on the blog. Need to visit both of them next time! Funny how you'd post on Wahoo's, Elmo, because I was just reading your review on Baja's Fish Tacos the other day. I tried Wahoo's recently - was hesitant at first because of all the negative comments on your Baja's post - but I found it surprisingly tasty. I guess I'm not much of a Mexican food conoisseur, but the grilled fish works for me, with a tinge of lime and hot sauce. Thanks for filling me out on "Mr. Lee's," because the hot sauce rang a weird note. Is this the "code word" at all Wahoo's locations, or will they think I'm an idiot if I ask for it in Newport Beach? I complete agree with you a 101% fish tacos must be a d@mn fried one not the grill crap. That Mr. Lee's stuff sounds good! I love me some spice, and put Sriracha on just about everything. On a slightly unrelated note...We went to a fish taco place in Tustin a few years ago. I can't remember what it was called, though. The fish was fried. The name of the place sounded like it could be a man's name. What is this place? I liked it a lot! I had 2 tacos, which is odd for me, since I have a very small appetite. I think you told me about this some time ago. Need to try it. I assume you went to the one on Newport, so I'll be sure to go ask for it! I was soooo scared that you were going to write a review of how good Whaoos food was. Then I would have had to tee off on you and go ballistic. I am so glad you see the glory of the fried fish taco and will champion its cause and what it represents to mankind. This sauce you mentioned in your review certainly seems interesting. But not interesting enough to have to eat at Wahorible. So I am attaching a realy easy to make hot sauce recipe so none of your readers ever have to go to Wasucks again. have never had a wahoo fish taco. yet. Great post. I have to agree with you that Wahoo's has just absolutely horrible fish tacos, I find that it is just so dry and quite bland. However, I love their enchiladas. You absolutely must try their green sauce, it's not a tomatillo based one, or at least I don't think it is. It's actually a creamy cilantro type sauce for the enchilada that is just so great, especially if you get blackened mushrooms. It's delicious and kind of healthy I think. Wahoo's = Bland food; glad to see Sambal can rescue it. What I don't understand about Wahoo's is that they can offer French FRIES (yes Fried) yet can't fry a piece of fish..
Charbroiled fish banzai bowl, no terriyaki (makes the fish mushy) is a great open canvas for Mr. Lees. Wahoos is not Mexican food! It is a Orange County healthy mex that rocks of you're looking for beans, rice (brazilian style) and a grilled piece of protein. You can't compare Wahoos to fattening legit Mexican, that is unfair. Now I have to re-read the comments on the BFT post! I do remember saying unkind things about their fish tacos, but that's just my M.O. I think I may have also said something when I talked about Los Cotijas' fish tacos, which are still one of my faves. Mr. Lee's should be everywhere in all the OC Wahoo's! I think they'll charge you if you ask for it as a side order when you order. But it's free if you ask after the order's been rung up or you're eating in. Notice that the Tapatio is there on the table, but was unused! No need when Mr. Lee's is on the job. Was it Los Cotijas? Next to Busy Bee? That's currently my fave around these parts. There are others of course, if I venture outward towards other counties. As a person who likes spicy food, I think you'll dig it the most! - Chop the chilies, onion, and garlic in a food processor or grind in mortar and pestle. - In a small frypan, sautae this mixture in oil until well cooked. Do not brown. - Add the kemiri nuts, laos, trasi, and salt. Stir and mash until it is well blended. - Add the tamarind liquid and sugar; simmer until the oil separates out. - Cool, and serve cold. Don't!!!! Try the enchiladas instead! Trust me on this! HAHA! Well that's interesting. Honestly, this trip was the first one I made to Wahoo's in a decade (I think). I was debating the mushrooms actually. I think I just might try that creamy cilantro sauce. That's sounds like it's like gourmet or something! I know right?! They also do onion rings. So apparently they also have the batter! Well played sir! I like the way you think. The bowl then is just an excuse for the Mr. Lee's! I do like their rice a whole lot. It's quite surprising how good it is, actually. I don't think that was it. It was at a mall. I want to say it started with an "r". It's been three years, so the name escapes me. But I'm sure I'll know it when I see it. "Wahoo's is to Mexican food as Panda Express is to Chinese food." It's more important if you like the food or not, not whether somebody else thinks it's authentic. And, yes, I do give points for authenticity; it's just not the only factor to look at. Hard concept for some people to grasp. Actually I think I'm going to go get some Panda Express now. Their new Sweetfire (is that what the call it?) Chicken is pretty good. "You can't compare Wahoos to fattening legit Mexican, that is unfair." Not all legit Mexican food is fattening. Another hard concept for some people to grasp. AHHHH! Rubio's! Yes. I remember you mentioning that once. They're everywhere now! In fact if I look out the window of my office, I can see one! You forgot one more thing: Not all Mexican food reviewers are Mexican. HAHAHA! Sorry. I know. I'm only funny to myself. That's the place! Those were some tasty tacos. Of course, I was enjoying myself so much during our visit. So my happy mood might have had something to do with it, too. ...I was terrified that the influential and extremely valuable, maximum-52-posts-per-year real estate known as Monster Munching was going to be used to sing the praises of the (IMHO) eminently inferior establishment known as Wahoo's Fish Taco. In that frightening split second, I was stunned that because of this post, the world may actually be led to Wahoo's dry, bland, "Mrs. Paul's"-caliber fish pieces. In a millisecond within that frightening split second, I felt especially upset that the far superior Baja Fish Tacos was being dissed. But thankfully, the post would merely be an acknowledgment of some flavorful little condiment that's only available via secret code, like the "animal style" burgers at In-N-Out. And with that, I can close my eyes in bed tonight and know that the universe will live on for at least one more day. Even more important than almost anything else! Comments like yours are the reason why I keep doing this! Thanks!!! LOL. even this looks good at this point. hahaha. All this talk about food is making me HUNGRY!! I'm going to find something to eat! 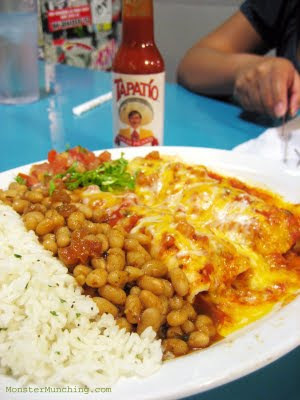 maybe i'm not a legitimate foodie, but i really like wahoo's... especially their enchiladas!! and the rice! omg. they also have brown rice now. it's simple food, yeah, you COULD make it at home yourself, but why bother when you can go and have it with a fresh mountain dew for like $6?! They bring it to you, no dishes, and always smiling faces. the employees are always very friendly. no, it's not "true mexican" but who gives a damn? I've been going here for about 5 years now and as much as I LOVE hot sauce I haven't once thought about trying "Mr. Lee's". and its free. fml . Oh I just posted about the new Wahoo's opening at UCI too. I'm so excited! I have always ordered the Mr. Lee's ahead of time and have even ordered a large (8 oz?) to go which I took home and used on everything I was eating at home. The only problem was that it was given to me in a styrofoam container and after a day or two, the chili oil had completely sweat through the foam and on to the surrounding shelf. This stuff is the reason to go to Wahoo's. Also Wing Lam (the owner) is an incredible guy. 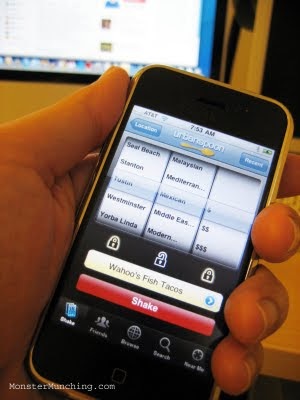 Do you buy it directly from the Wahoos restaurant or online?